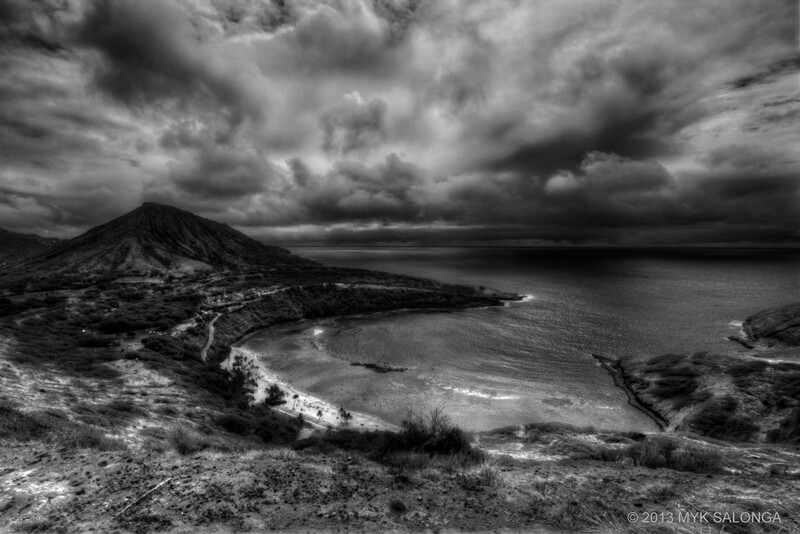 Ominous clouds circle above as tropical storm Flossie makes its way through Oahu and famous Hanauma Bay. On the horizon, black rules under layered clouds bringing rain and wind. Although it is extremely rare for hurricanes or cyclones to hit the Hawaiian island chain, storms do occasionally keep enough strength to make landfall. Flossie was much touted in early stages, but in the end was downgraded to a tropical storm with 6 – 10 inches of rain and gusty winds around 40 mph in various parts of Hawaii. Haven’t seen clouds like this over Hawai’i in almost twenty years!